In another touching family March 9 release, a dog named Hachi continually goes to wait for his master Richard Gere at the train station, even after Hachi's owner is no longer expected to return. Likewise, we discover in the latest Hannah Montana DVD that coincides with the season three finale, horses are just as loyal as dogs. And this is especially the case when-- after moving from Tennessee to California-- Blue Jeans, the horse of Miley Stewart (played by Miley Cyrus) continually follows her around Malibu like a dog named Hachi. Soon, the high school student by day and secret pop star by night (with a wig and the name change of Hannah Montana) must decide if she needs to give up the rock 'n roll lifestyle to return with Blue Jeans and her father (Billy Ray Cyrus) back to Tennessee. Given the title Miley Says Goodbye?, this DVD-- consisting of six episodes including one that runs double the length and the final two-parter-- offered fans the chance to discover the future of Hannah/Miley before viewers of her smash Disney Channel series had the same luxury by releasing it nearly a week before the verdict was in regarding whether or not this would be the end of Hannah Montana. Without spoiling the answer for those who are without cable or whose children missed the episode, I can share that in the 135 minute running time, there's a whole lot for audiences to explore in addition to what no doubt, Miley's ardent fans feel is the ultimate cliffhanger since she quit Twitter and then performed a rap video explaining why. And even though I didn't loathe the Hannah Montana Movie nearly as much as some of my colleagues since it makes no sense to me why a film for young women could cause so much hatred, I must admit that the television series is much harder for adults to tolerate than the movie given the overly broad humor that gives us the impression the actors would be better off starring in a high school play rather than a TV show. 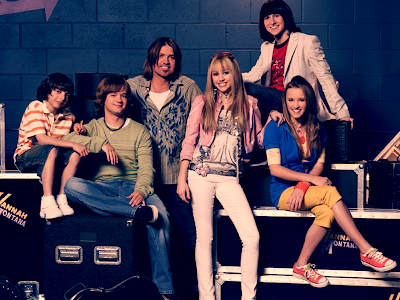 Although iCarly is known for its loud shouts of its sugar-rush cast, Hannah Montana is even louder. And unfortunately, Montana doesn't have the universal appeal of Nickelodeon's creative Carly as the plot-lines are far more simplistic, obvious jokes are repeated and punctuated by another shout or gesture that feels better suited for the stage when viewed way up in the cheap seats rather than five feet away on television. Additionally, aside from Cyrus' Miley Stewart a.k.a. Hannah Montana, every other character is left by the wayside, just existing to help serve Miley's storyline or run to her side whenever they call one another with a boy or Blue Jeans related emergency. Despite the likable, energetic cast and catchy tunes along with fun guest appearances by Dancing With the Stars judge Carrie Ann Inaba and American Idol's David Archuleta along with the promise of more depth in the plot when, for example, Miley is given her first checkbook in lieu of an allowance, overall, it's a one-note tween comedy that maturity wise runs on par with True Jackson, V.P. and just behind iCarly or superior older fare like Make it or Break It. Although it's not quite as free-spirited yet well-developed for entertainment sake as JONAS, the one standout on the DVD aside from the final two-part season three finale that her die hard fans will crave is the inventive “He Could Be the One” episode. Part of the reason this one grabs your attention right from the get-go is that it's ingeniously set-up although it is in fact a stage play and is all the better for it as Miley/Hannah must choose between two boys, both of whom are inconveniently disapproved of by daddy Stewart. Light on the bonus features, the DVD which is presented in full screen aspect ratio-- necessitating you use a full zoom or similar setting to fill your widescreen television-- is very kid-friendly in its FastPlay set-up by moving right into the program and from one episode to another without the need of constant remote flipping or too much adult involvement. Therefore, given the running time, it's an ideal DVD to bring out at your daughter's next sleepover, even if you may find yourselves wanting to turn the volume down due to all the unnecessary shouting.